I interrupt my series of posts commemorating the 60th anniversary of Cinerama at this point because the 2012 CiMBA Awards from the Classic Movie Blog Association have been announced — and Cinedrome has been honored with “Best Classic Movie Article” for my six-part series on Orson Welles’s The Magnificent Ambersons. I won’t bore everybody with an endless Oscar-style acceptance speech, but I do want, gratefully, to thank my fellow CMBA members for this recognition, and to acknowledge the work of the many Welles biographers and scholars, especially Simon Callow and Prof. Robert L. Carringer, whose previous work contributed so much to my own and made my research such a pleasure. My conclusions may have differed from theirs, but I couldn’t have done it without them. Links to the six parts of my Ambersons article are below. 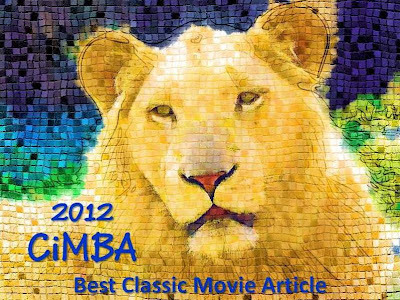 Meanwhile, you can go here for a complete list of CiMBA winners and nominees. Warmest congratulations to them all — and again, a grateful “Thank you!” to my colleagues for this honor.